2016 sees the 30th anniversary of Russell Hoban's children's story The Marzipan Pig, and with it this October comes a new edition in the New York Review Children's Collection imprint. The new edition comples complete with the original charcoal drawings now tinted by illustrator Sir Quentin Blake. Writes Rebecca Rego Barry in an article for the Guardian: "In this timeless tale, a sentient candy pig falls behind a couch, where it is consumed by a sentimental mouse that is, in turn, eaten by an owl who falls in love with a glowing taxi meter, and so on. 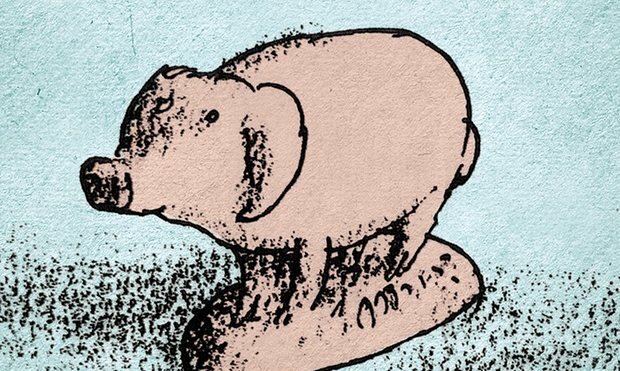 "Full of charm and adventure, The Marzipan Pig begins and ends with the consumption of a delicious almond confection, and yet that simplicity – or sugarcoating – belies the power of Hoban’s fable."